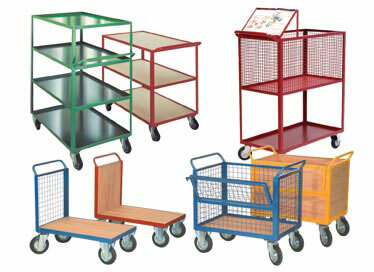 Trolleys and trucks for all industrial and commercial applications, available in a variety of colours. Range includes workshop platform and box trucks and trolleys, swarf and refuse tipping trucks, and mobile cupboards. General or heavy duty, welded construction with plywood deck and reinforced steel base, available in a variety of styles and colours. A range of trolleys for transporting tools and equipment. For mobile, visible storage of bulky items. Designed to simplify the movement and disposal of waste and refuse. Robust, rigid construction for heavy duty workloads. Mesh sided for instantly visible contents. For mobile, visible storage of bulky items in distributuon and production areas.